Photos of a huge circle of churned-up Martian soil leave few doubts: a European Space Agency (ESA) probe that was supposed to test landing technology on Mars crashed into the red planet instead, and may have exploded on impact. The European space probe Schiaparelli may have crash landed on Mars after suffering problems releasing its parachute and firing retrorockets to slow its descent, it emerged today. At a briefing this morning, the European Space Agency (ESA) said there had been technical failings in the final 30 seconds before landing. Schiaparelli’s touchdown was supposed to prove that the ESA had the capability to land on Mars ahead of the second part of the ExoMars mission to place a rover on the planet in 2020, which will drill into the surface looking for signs of life on the Red Planet. But there were fears that the problems could impact future funding. European ministers will meet later this year to decide whether to give the green light to the 2020 mission. Andrea Acoomazzo, ESA Spacecraft Operations Manager, said that everything had gone to plan for the first five and a half minutes of descent but then events ‘diverged from what was expected’ during ejection of the parachute and heat shield. 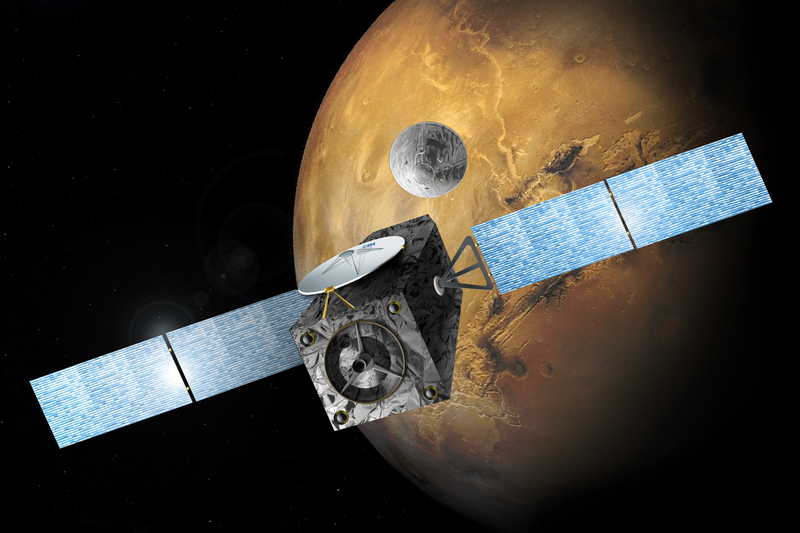 TGO’s Mars orbit Insertion burn lasted from 13:05 to 15:24 GMT on 19 October, reducing the spacecraft’s speed and direction by more than 1.5 km/s. The TGO is now on its planned orbit around Mars. European Space Agency teams at the European Space Operations Centre (ESOC) in Darmstadt, Germany, continue to monitor the good health of their second orbiter around Mars, which joins the 13-year old Mars Express. The ESOC teams are trying to confirm contact with the Entry, Descent & Landing Demonstrator Module (EDM), Schiaparelli, which entered the Martian atmosphere some 107 minutes after TGO started its own orbit insertion manoeuvre. 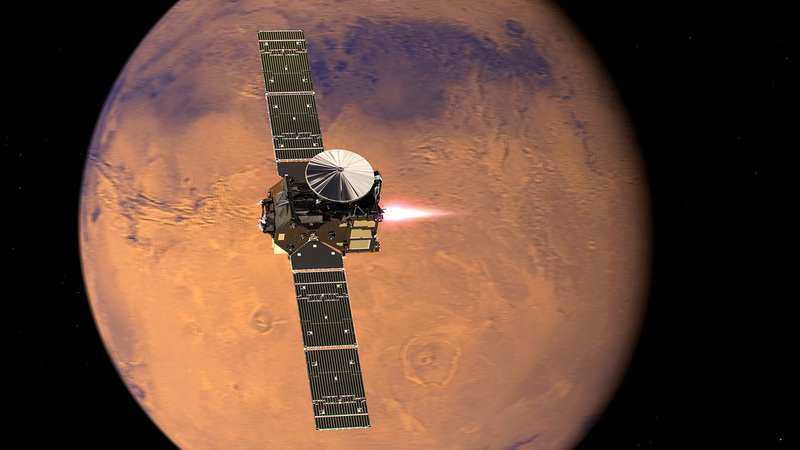 Artist’s impression depicting the separation of the ExoMars 2016 entry, descent and landing demonstrator module, named Schiaparelli, from the Trace Gas Orbiter, and heading for Mars. 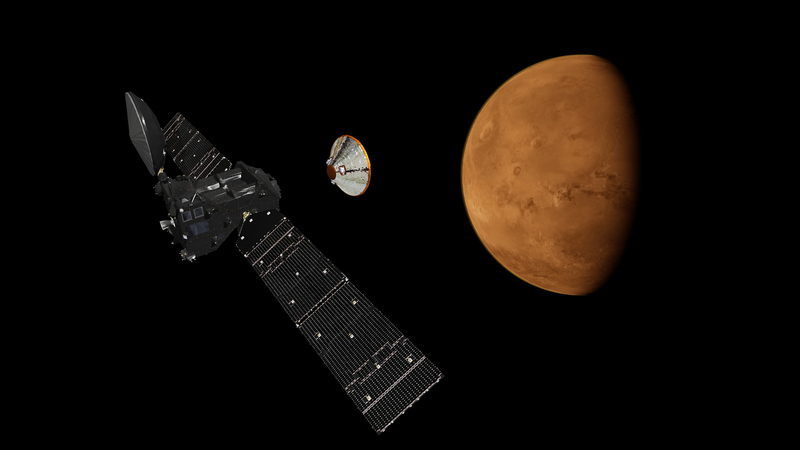 This week, ESA’s ExoMars has just a single chance to get captured by Mars’ gravity. The spacecraft and the mission controllers who will make it so are ready for arrival. The ExoMars Trace Gas Orbiter is on a multiyear mission to understand the methane and other gases in Mars’ atmosphere at low levels and could be evidence for possible biological or geological activity. 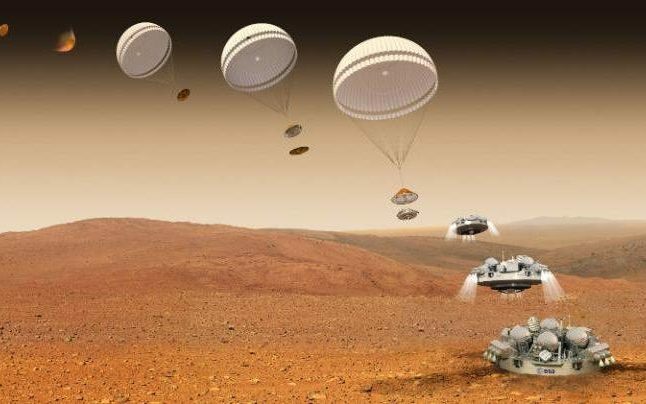 The 3.7 tonne mothership is carrying the 577 kg Schiaparelli lander that will test key technologies in preparation for ESA’s 2020 rover mission. The pair have almost completed their 496 million km journey, and are now speeding towards a critical stage: releasing the lander on Sunday and the lander’s descent and touchdown next Wednesday, at the same time as the main craft begins circling the planet. “They are now on a high-speed collision course with Mars, which is fine for the lander – it will stay on this path to make its controlled landing,” says flight director Michel Denis at mission control in Darmstadt, Germany. “However, to get the mothership into orbit, we must make a small but vital adjustment on 17 October to ensure it avoids the planet. And on 19 October it must fire its engine at a precise time for 139 minutes to brake into orbit. 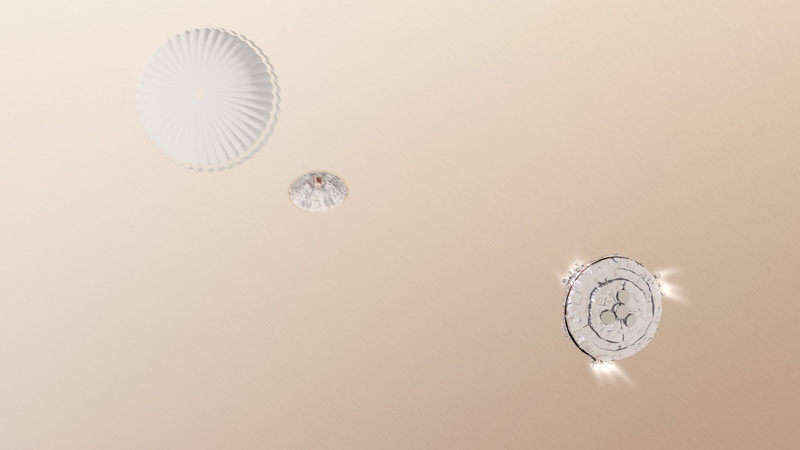 Visualisation of the ExoMars Schiaparelli module entering and descending through the martian atmosphere to land on Mars. Nearly 13 years after the British spacecraft Beagle 2 went missing on Mars, the European Space Agency’s Schiaparelli module will touch down on the red planet — assuming everything goes according to plan, that is. The module, which launched with the ExoMars Trace Gas Orbiter in March, will serve primarily as a test bed for the descent and landing systems and is expected reach the surface on October 19th. Unlike NASA’s Curiosity rover, which has been exploring Mars for four years now, Schiaparelli’s mission is a short and immobile one. The module relies on a battery source that is expected to last somewhere between two and eight Martian sols. (At about 24 hours and 37 minutes, a sol is slightly longer than an Earth day.) The ESA plans to land Schiaparelli in the Meridiani Planum, which NASA’s other long-running rover Opportunity explored in 2004. During it’s short time on the surface, Schiaparelli will study the electrical fields that trigger Martian dust storms and weather patterns, then upload the data back to the Trace Gas Orbiter to transmit back to Earth. The satellite, called the ExoMars Trace Gas Orbiter (TGO), lifted off from Baikonur in Kazakhstan at 09:31 GMT. The probe will investigate whether the methane in the world’s atmosphere is coming from a geological source or is being produced by microbes. If all goes well, the two space powers expect to follow up this venture with a rover, to be assembled in the UK, which will drill into the surface. That could launch in 2018, or, as seems increasingly likely, in 2020. Artist’s concept of Europe’s Trace Gas Orbiter releasing the Schiaparelli landing demonstrator near Mars. The next robotic mission to Mars will launch in less than a week, if all goes according to plan. The first part of the two-phase, joint European-Russian ExoMars mission is scheduled to blast off atop a Russian Proton rocket from Baikonur Cosmodrome in Kakakhstan on March 14. A slight delay can be accommodated; the launch window extends through March 25. The Proton’s payload consists of the Trace Gas Orbiter (TGO) and a lander called Schiaparelli, both of which should arrive at Mars in October after a seven-month cruise. TGO will sniff the Red Planet’s air from orbit using four scientific instruments, hunting for possible signs of life. “The orbiter will perform detailed, remote observations of the Martian atmosphere, searching for evidence of gases of possible biological importance, such as methane and its degradation products,” European Space Agency (ESA) officials wrote in a mission description.